I am running a T7200 C2D laptop w/ Crunch3r BOINC 5.9.0.32 and V 1.41 ssse3 ap. Did not change anything in General Prefs. Connect to = 4 days. My work cache won't DL more than 3-5 WU which is basically a cache of 2-3 hours, not 4 days. No other projects on this host. Just enhanced. My other 2 boxes, iMactel 2.0Ghz and G4 seem to maintain normal cache levels, both w/ default BOINC 5.4.9 for OS X w/ the same Gen prefs. specified of 4 days. The iMac also runs Beta 5.18 ATM. Would changing each host to a different location, ie. home, work, school make a difference? Can't figure out why I can't get more work to the T7200 laptop. 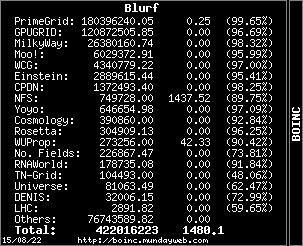 Is there a setting w/ the optimized BOINC client I should change? It would help if you unhid your computers so we can see what is happening on your account. Also post your Message tab log. Message 506792 - Posted: 21 Jan 2007, 23:21:17 UTC - in response to Message 506710. Whoops. Thanks! They're visible now. 1/21/2007 2:42:27 PM||Pend. Brk. EN. Message 506841 - Posted: 22 Jan 2007, 0:46:18 UTC - in response to Message 506710. Also post your Message tab log. For win you point the cursor to the right of the text, left click and drag to highlight the lines, then pick the box "copy selected", or you can pick "copy all". You might just highlight the text and hit Ctrl-C, then click in the reply box and hit Ctrl-V. I need to point out for people that the 5.9 client isn't anywhere near stable. It is still a few months from even begining the testing process. We won't actually start to increment the version of the 5.9.x clints until we think we are done with the feature set and start the stabilization process. So if you are using 5.9 right now, you are using a very unpolished build. Expect that a few things don't work or are only half implemented. Message 506878 - Posted: 22 Jan 2007, 1:44:39 UTC - in response to Message 506859. Ah. I misunderstood. I thought you were saying that there was a way to display one's hosts *and* the link to all the message board posts by that person. You know, that link you have when in "your account". Never mind. Well, I removed my S@H project folder and BOINC project & host files, uninstalled 5.9.0.32. Installed 5.4.11 and replaced my files back into the BOINC folder. Fired it up, ran benchmarks, and it immediately downloaded additional WUs @ 4 days cache before resuming crunching. Didn't miss a beat. So, it appears something isn't working properly w/ 5.9.0.32, my C2D and BOINC general prefs....at least on this host anyway. Issue is gone with reversion back to 5.4.11. Anyone else w/ C2D running 5.9.0.32 notice similar? I was having trouble with my XP laptop with 5.8.3. Loaded 5.9.0.32 over it and it ran beautifully but was having CPU spikes and crashing. Going back to the older version now. Anyone have a link to Boinc 5.7??? Can't find it on their page. Message 507307 - Posted: 23 Jan 2007, 1:05:43 UTC - in response to Message 507303. 5.7.?????? You name it, I can link it. Astro- thank you kindly. When I have 15 minutes to spare I can work on getting my laptop back up. Give the community a shout when you need some testing. All BOINC3rs are looking forward to it! Message 507679 - Posted: 23 Jan 2007, 21:29:46 UTC - in response to Message 506914. I don't see that behaviour on any of my computers, it works well for me. Message 507757 - Posted: 23 Jan 2007, 23:41:27 UTC - in response to Message 507679. I may be suffering from some of the server related issues on Berkeley side the past few days. Probably will give things a week or two to settle down, and I'll try again. I backed up 5.4.11 first, then I just copied 5.7.5.32 over 5.4.11, then tested It to make sure It worked, Then I copied 5.9.0.32 over 5.7.5.32 and tested It and It runs on all 3 of My PCs that are running, It does require .net 2.0 of course, Which is also installed on all of My PCs(Running or not).